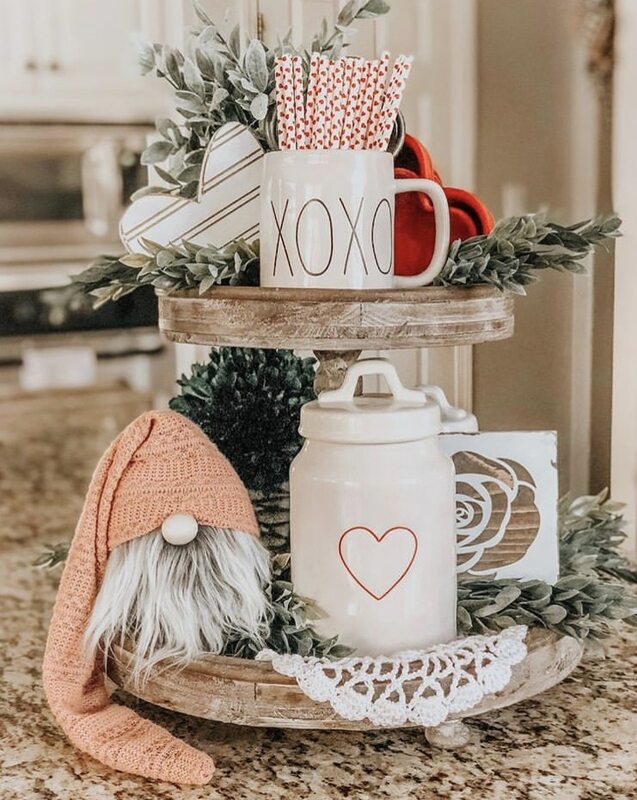 Are you searching for a lovable tiered tray to inspire your Valentine Day decor? 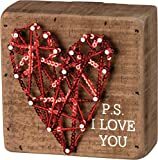 We are showing off our friends Valentine day decoration ideas and we think you will be inspired. 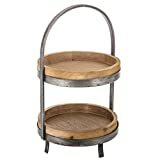 Valentine tiered trays have a way of making guest feel warm and cozy inside. And wait until you see these amazing Valentine day decoration ideas. We’re about to share with you some lovable holiday trays that have been assembled with heart and soul. 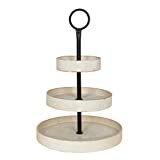 If you are new to the world of tiered trays you may be wondering what is a tiered tray. Well, it is stacks of plates or stands that people use to display beautiful items, food or in our case holiday decor. 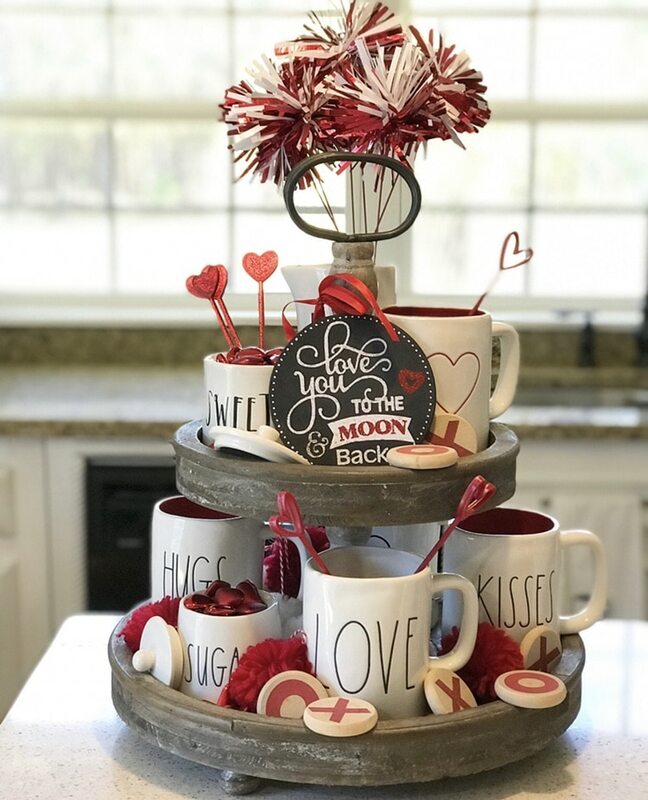 If you don’t have a tiered tray check out some of our best suggestions after you glance at all these heartfelt Valentine tiered tray ideas. April is a first timer for us to feature. 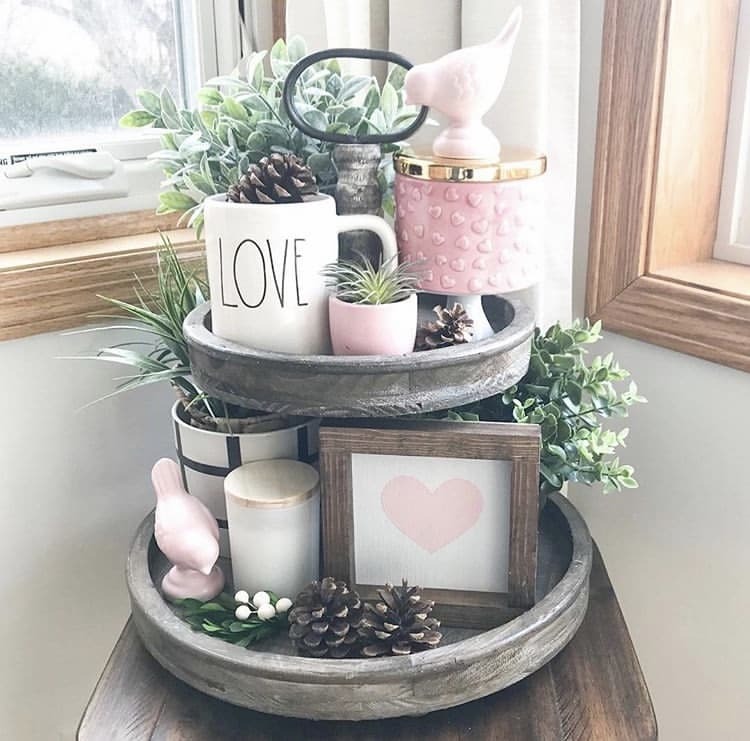 We really enjoy the subtle hints of pink color in her tiered tray. She also gives us a Rae Dunn piece that encompasses Valentine’s Day with the word Love on it. 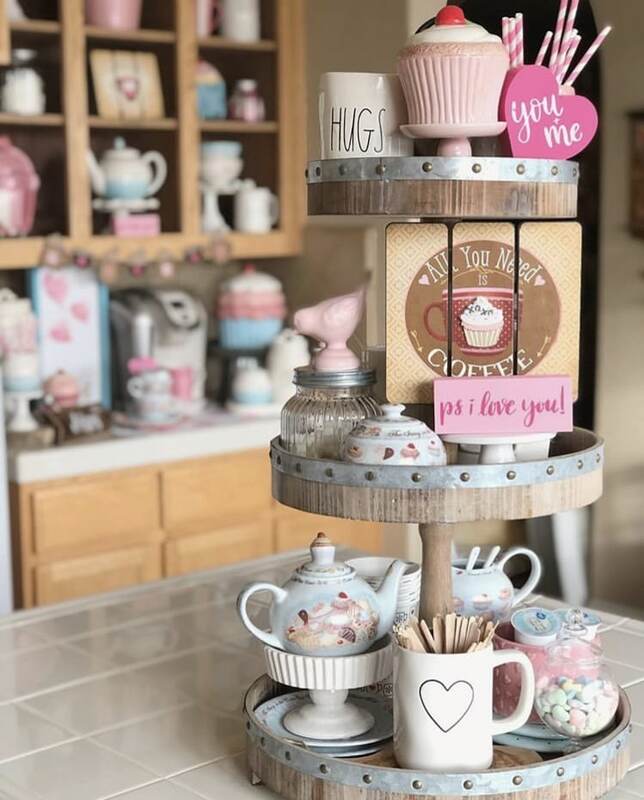 Our Valentine Tiered Tray post from last year features Kelly and her great talented decorative tiered tray. She creates some of the pieces she displays on her tray and she never disappoints with her Rae Dunn pieces! Thanks Kelly for joining us on our blog again with your Valentine beauty! Hello Rae Dunn and Brittney! 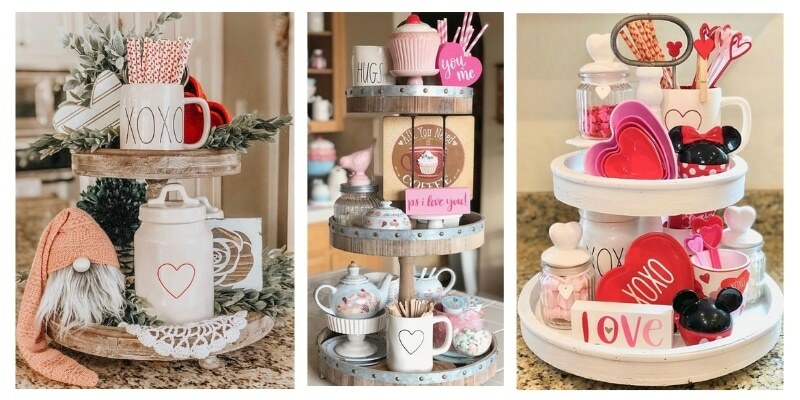 You have put together a stunning tiered tray for your Valentine’s decorations! 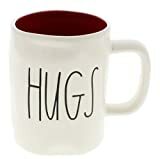 And we totally spot those cute marshmallow mugs. 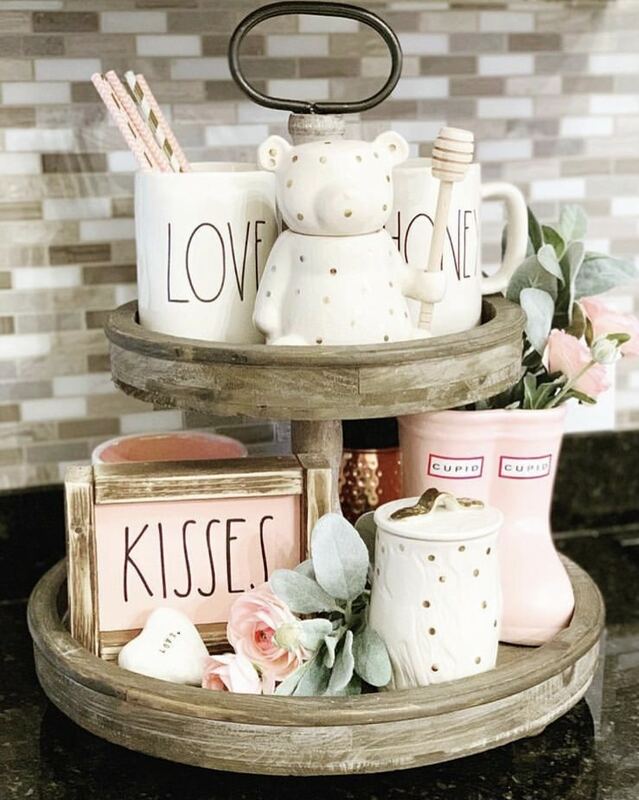 Sweet honey and love drip from this Valentine’s tiered tray! The white and gold polka dot honey bear is precious the pink vase that’s rain boots are show stealing. 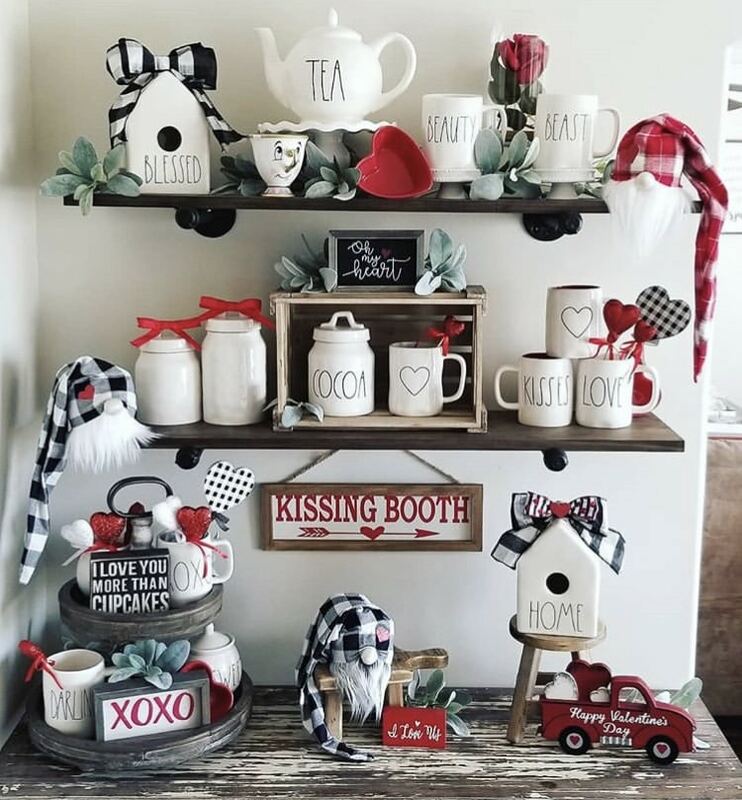 If you have a Rae Dunn stash and are looking for Valentine Day decoration ideas, Brittany & Nicole have a great display. There is read sprinkled throughout the shelves and lots of buffalo plaid to add the vintage black and white feel. Molly always decorates her tiered trays with the most sparkle! Gold for sure is a way to show your love to someone special. 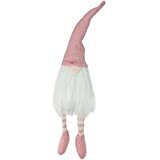 Pink gnomes and hugs and kisses are perfect for Valentine’s decor. Pam’s Rae Dunn pieces tie together all things lovable on her tray. 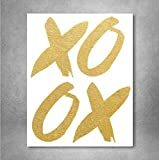 Letting all know that they are loved to the moon and back by spelling it out sweetly with a sign and read hearts and xo’s is a great idea for Valentine’s decor. Disney fans, this is tiered tray is for you! 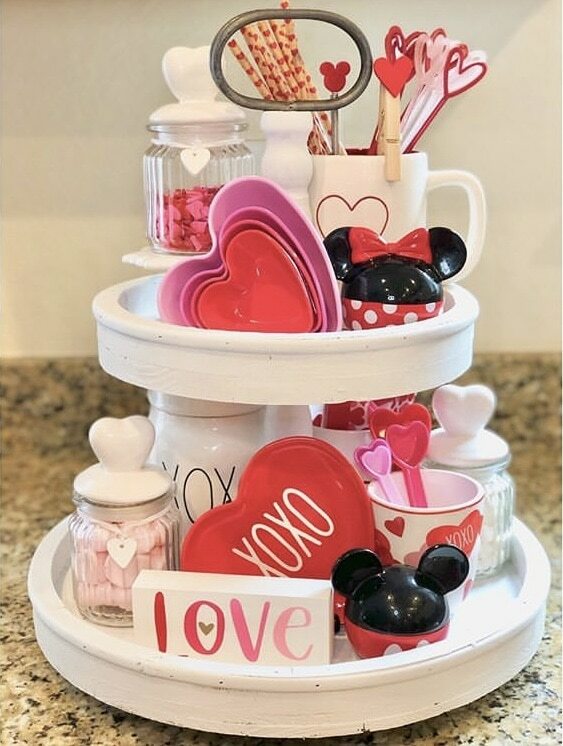 Adding Minnie and Mickey to a tray adds a classic couple to a romantic display. 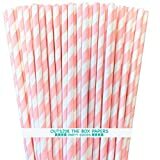 Sweets sprinkled throughout along with heart tipped stirrers leave you craving somethings to warm your heart. Selecting what to style on your tiered tray is a process and an art. 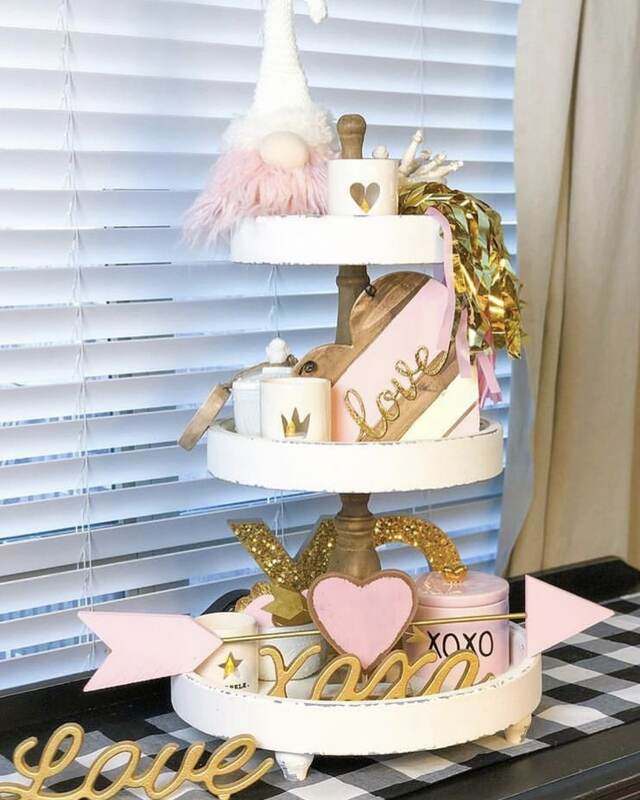 We just recently helped out with hints in styling a tiered tray on our Adorable Valentine Day Table Decorations post. Mylissa’s is styled perfect with greenery that peaks out in just the right areas. Adding gnomes and Rae Dunn never hurts a tray either! 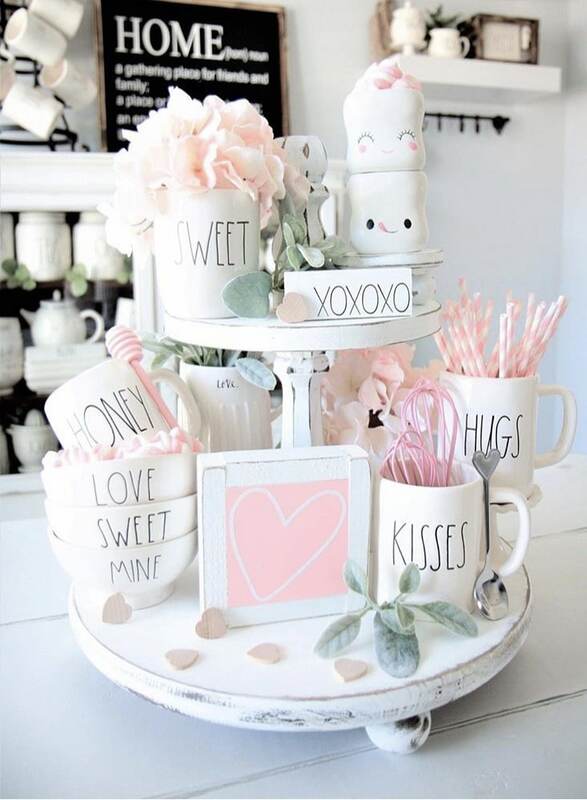 Cupcakes are super cute to doll up your tiered tray. And what goes better with cupcakes than coffee or tea. Mayra’s tray is sweet and full of great surprises. Do you feel loved and want to spread the love around now? These trending Valentine’s tiered trays were too good to keep to ourselves! 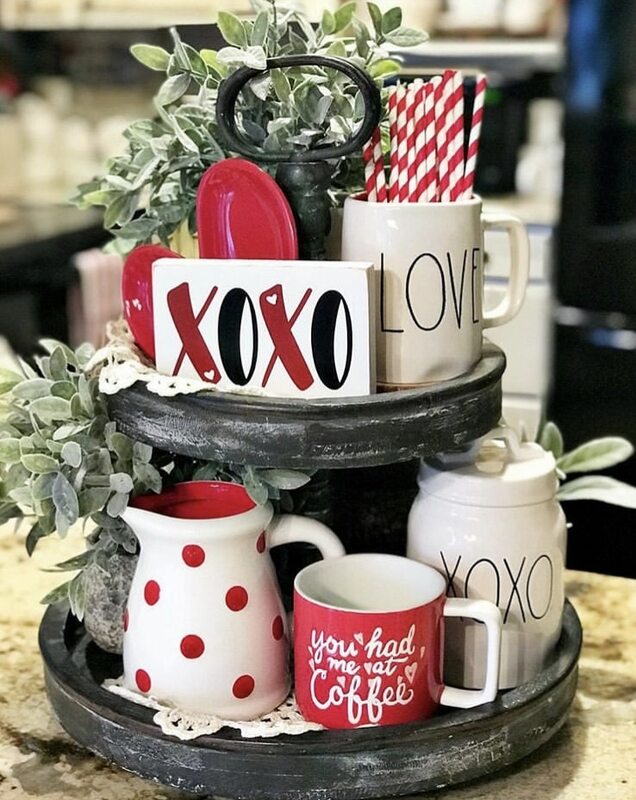 Now all you need is a DIY on how to make a tiered tray and how to style a Valentine tiered tray and we have that in a post for you too.